Africa, a beautiful place indeed, but a wild and sometimes unforgiving place as well. And it is reflected in its rivers, the arteries of this lovely continent. Take for example the majestic Victoria Falls, breathtaking in its splendor and beauty, and below that, nestled at the bottom of the cliffs of the Batoka Gorge flows the mighty Zambezi River, reputed to have the wildest one-day white waterrun in the world. South Africa itself has been tamed a long, long time ago already. No more lions roaming the streets of Johannesburg! And most of its rivers were tamed as well. But that doesn't mean there are no more places left where the "wild-at-heart" can go and play. The two big tributaries of the Umzimvubu River in the Transkei, the Tina River and the Tsitsa River, have been kayaked for the very first only in the last few years! These rivers have never been rafted yet! And they are HUGE! Feel like doing some exploring? With a huge amount of excitement and adventure thrown in for good measure? Then come to Africa! 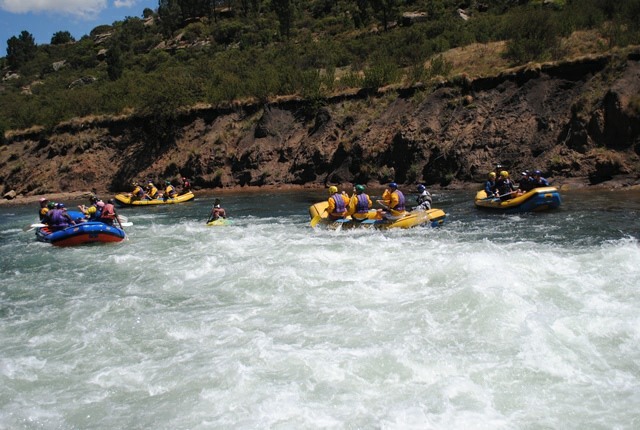 White water river rafting is one of the most popular adventure activities in South Africa, and with several major Rivers, ranging from mild to wild, a great climate, and friendly people, it's not difficult to see why. The rivers of South Africa have it all, dramatic scenery, remote wilderness areas, exciting rapids, and Africa's beauty and charm. Few things come close to the experience of a multi-day rafting safari on one of the many rivers in South Africa; lazily floating along on the calm flat stretches of the river, interspersed with the excitement of rapids, camping out at night under the stars, with the camp fire blazing! Get set for the adventure of a lifetime! South Africa is a relatively dry country, but with some awesome white water to offer the visitors to this lovely country. The Orange River, named after the Prince of Oranje by Dutch colonials, is the biggest river in South Africa. It is 2 200 km long, with it's source high up in the Drakensberg Mountains of Lesotho. As the Orange River flows westwards across the vast subcontinent to the Atlantic Ocean, the landscape through which it flows, grows increasingly arid, flowing through the Kalahari, a very dry, semi-desert area, and finally through the ?? ?, one of the world's driest deserts. It is an awesome experience to paddle through this harsh, but beautiful environment. The Orange River is mostly known for its very enjoyable multi-day, self-contained river raft and canoe trips suitable for the whole family. Two-man Indian type Mohawk canoes are used, as well as 2-man inflatable rafts known as 'crocs' here in South Africa. These trips are leisurely affairs, mostly drifting along on easy white water and camping on sandy beaches under the stars at night. These raft trips are also known for their exquisite cuisine (for river trip standards) and the clients are usually pleasantly surprised by the cooking talents of the river guides, who must prepare meals with the bare minimum on open fires. Rafting trips can be undertaken all year round, on the Orange River, even in Winter, when temperatures are mild. 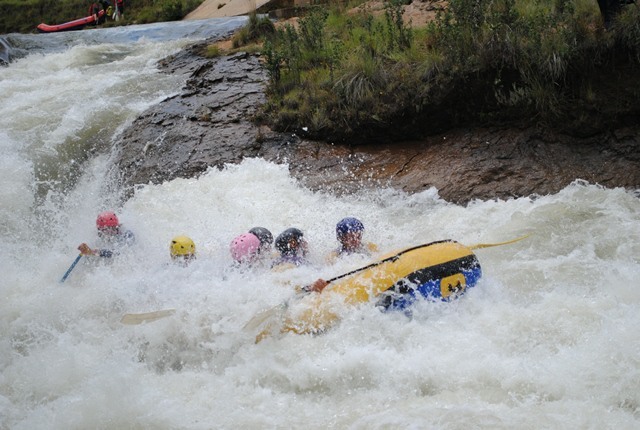 The best time to enjoy white water rafting on most of the other rivers in South Africa, is in the warmer summer month, between November and April, as it is then when the rivers are full from the rainy season. And that means exciting white water action! Some of the most thrilling white water rafting opportunities in South Africa can be had along the mighty Tugela River and the Mkomazi River in KwaZulu-Natal. The Blyde River in Mpumalanga is also known for its serious white water and spectacular scenery. The Western Cape around Cape Town gets Winter rainfall, however. Here the Doring River stands out as a very exciting paddle to undertake in early spring. And the Palmiet and Breede rivers in the Cape are also worthwhile to explore for a relaxed outing in nature. The Great Usutu River in Swaziland also offers really good white water rafting most of the year. 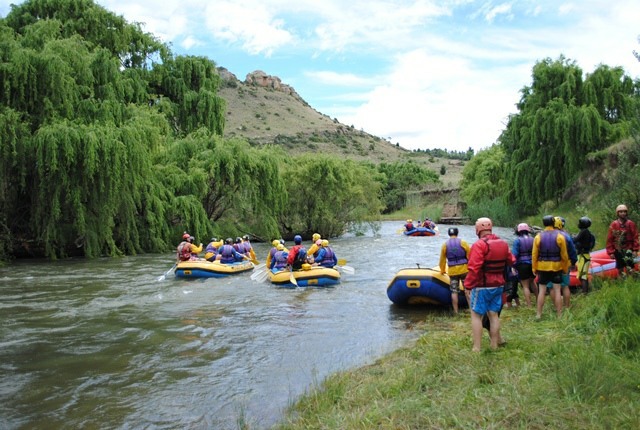 Then there is the Ash River, near the small arty-farty little village of Clarens, fast becoming known as the "Adventure Capital" of South Africa, there in the eastern Free State. The crystal clear water gets tunneled from the Katze Dam high up in the Maluti Mountains of Lesotho and flows down the Ash River all the way to the Vaal Dam. It is the only river in the country with a constant, high, water-level all year round, which allows Outrageous Adventures to run exciting white water rafting trips throughout the year in the big 6-man rafts. Very exciting grade II to IV rapids make for an exciting adventurous day out on the river! So yes, South Africa has some awesome adventure activities to partake in, and white water rafting stands out as one of the most enjoyable and exciting. When in Africa, make sure to use the opportunity and experience the vast beauty of this continent from a raft and satisfy the need for an adrenaline-rush at the same time!